I had several micro-businesses over the years including Cat’s Print Cookies, which my daughter and I hawked at fairs and musical events, and The Magical Brain Trust, a typing and editing business while my daughter was growing up. In the 1980s I wrote several cookbooks and sold them along with related products, which included a small scale vanilla business after I wrote The Vanilla Cookbook (1986, Celestial Arts). Then, in February of 1995, at the suggestion of a friend, I purchased vanillaqueen.com. I am the first and only owner. I paid $35 a year, the going price for any and all URLs at the time. It sat unused for five years while I considered what to do with it. Should I sell it or use it? Should I take the leap and launch a real vanilla business or play it safe and find a secure job? One morning in August of 2000 I awakened with an “Aha” moment. I would turn two rooms of my house into an apartment, rent it out, put together a business plan and go for it! It took a year to pull everything together. During that time I assembled an amazing team, including Gina Tassone (aka The Contessa), who has been my right and left hand woman, Kathy Long, who has dedicated untold hours over the years building two websites for our business, much of it pro bono, and Brad Wise, who offered his creative expertise, including the layout for The Vanilla Chef and graphics for trade shows and product handouts. Over the years, there have been several other people who have worked with us full or part time or who have provided us with invaluable services. I debated whether to first go to Tahiti for research and photos for the site, then launch the business, or launch the business then go to Tahiti. Fortunately, as it turns out, I went to Tahiti first, then returned home and officially launched the business a few days later. There were already a few cracks in the Internet infrastructure as the dot.com crash occurred about six months earlier. While Internet commerce looked promising, it wavered when the dot.com bubble burst. However, I was already months into building the website and moving forward and it seemed crazy to stop. If it was slow at first, so be it. September 9th I threw a launch party. My daughter and son-in-law came from New York and friends and family from all over joined us. It was an exciting leap into the unknown. Also a terrific party. Two days later, everything changed. Amazingly enough, along with this great tragedy came the first of our miracles. If I had gone to Tahiti, I would have been trapped there for at least three weeks. My daughter and husband would have been in Manhattan. While neither worked near the Twin Towers, they lived just blocks from the UN, which was assumed would be the next target. At the same time, my son-in-law’s father had emergency surgery in Arizona. They borrowed a car and drove to Mesa to help him, which would have been impossible from New York. The Anthrax Scare occurred on the heels of 9-11. All of us with Internet or mail order businesses watched helplessly as sales plummeted. Ours didn’t plummet; they didn’t happen. While that’s not quite true, for the first several months it was a big moment when each order arrived. Ever resourceful, we pulled together a multi-vendor two-day boutique in December. Despite the biggest storm of the year, people came and we limped through our first holiday season. Vanilla prices had been a low point for several years and farmers tore up their crops as they couldn’t afford to grow it for the price they were paid. 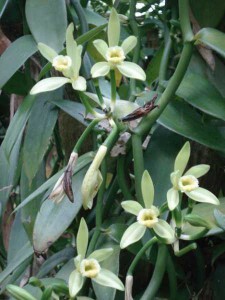 At the same time, a cyclone in Madagascar, a 100 year flood in Mexico, and a serious drought in Indonesia, destroyed much of the available vanilla. 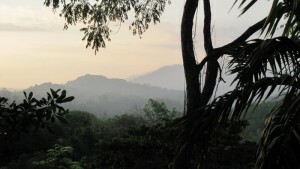 Over the next two years, vanilla prices soared to $550 a kilo at source! Because of our site, small farmers who normally didn’t have access to prices (the industry is known for its lack of transparency), contacted me. I helped them find buyers for their crops and received a small commission from the importers. The sales I helped to negotiate provided generators, trucks and other desperately needed commodities in Papua New Guinea and India. The importers kindly allowed me to buy a few kilos of beans at a time as there was no way I could afford to buy directly from the growers. Once again, we limped through but gained a reputation with the farmers. And even when I couldn’t help the farmers I gave them something no one had ever offered — information and hope. Some amazing bonds were forged during this time. Then the unthinkable occurred. Less than two-and-a-half years after launching The Vanilla Company, I was diagnosed with terminal breast cancer. One small lesion not detected by mammograms, one lymph node, and it was already in my liver. I was given pills to hopefully slow down the progression of the disease and told to put my affairs in order. At the time, I was writing Vanilla (2004, Tarcher; available on my site), we were in the middle of the hectic holiday season, and I was awaiting the birth of my first grandchild. There was nothing that could have prepared either me or my business for this shocker. Kathy hastily posted a web site for me so that friends, family and farmers could be kept informed of my condition. Almost immediately, and quite unexpectedly, I was showered with a world of miracles. Farmers and many others worldwide began to pray for me. In Hindu temples, Mosques, evangelical churches, schools and even entire villages, people prayed that I might somehow survive. It was both astonishing and humbling, a truly transformetive experience. Kaiser Hospital made an exception and allowed me to join my daughter and son-in-law at the birth of my first grandson, Theo, three weeks after my final diagnosis. Holding him against my breast while I rocked him the following day, it felt as if the hand of God was healing me. During this dark period I grew to understand the significant difference between healing and curing. Shrinking, leaving, healing, curing. Strong, healthy, cancer-free. For the next four-and-a-half years I was in aggressive treatment. I went into complete remission twice, a miracle in itself. But one tumor in my liver continued to return. Finally, in May of 2008, I had a surgery that is rare for breast cancer patients. Forty percent of my liver was removed, along with the tumor. More than three years later, I have remained cancer-free. Needless to say, intensive cancer treatment took a heavy toll on my body, and our very expensive small business insurance and the costs not covered by insurance used up the equity in my house. But I am alive. During the nearly eight years since my diagnosis my second grandson, Zane, came into the world, I traveled to Europe, Mexico, Cuba and China and met and worked with farmers and research scientists. In 2005, just before beginning a year of aggressive chemotherapy, I attended the inaugural Women Leaders for the World training through the Global Women’s Leadership Network at Santa Clara University. I have had the honor of speaking at the Smithsonian Institution, The Commonwealth Club and other national and international venues on behalf of vanilla farmers. I launched The International Tropical Farmers Network, a Google group connecting farmers, scientists and social scientists worldwide to support one another and to provide information and resources. I helped to organize a vanilla conference in Mexico in 2006 where all farmers could attend as it was free. Over 2500 people came to the conference! Unfortunately, I was unable to attend as I was in aggressive chemotherapy and the trip would have been too difficult. We raised the funds to help rebuild a hurricane-damaged school for the children of vanilla producers in a village in rural Mexico. We connected the dots, so to speak, to get vanilla and cacao vines from a farmer in Costa Rica, to a school in northwestern Haiti. I sponsored a farmer from Kenya for a year’s apprenticeship in Hawaii. These were some of the highlights. There are always many roadblocks in running a business, though they usually aren’t quite as intense as some of the ones we’ve experienced. We traveled the “Madagascar road:” unpaved, craters for potholes, unexpected dead-ends, and numerous collisions along the way. I had realized early on that the best way to grow my business would be to create value-added products. The money to bring these products to market was diverted for the overwhelming costs associated with a life-threatening illness. For the last year I have worked full time in an organic community market in addition to running the business. The Great Recession and lack of funds to grow the business have definitely been a deterrent to our company’s well-being. Yet ten years on, here we are! Gina manages the day-day details. On my days off from the market I do the writing for the site and blogs, make sales calls and whatever else I can to keep us afloat. Kathy continues to help us with updates and upgrades to our site. I am currently working to help three women from Africa to come to the Women Leaders for the World training, and we are raising money for supplies for the refugees in the Horn of Africa. 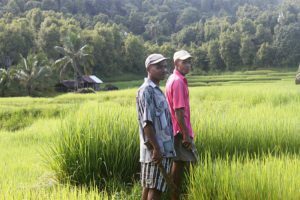 There are many miracles needed for tropical farmers and their environment as both are heavily impacted by climate change, poor wages and political upheaval and unrest. For the many of us who care, it can feel overwhelming. Yet if each of us donated one dollar a week — or even a month — toward assisting those in need, whether with the basics such as food, shelter and medicine, or the opportunity of an education, all of us benefit. Miracles come in many different forms. I believe that each of us has the capacity to create miracles for ourselves, for others and for our beautiful planet. I am looking forward to another decade filled with miracles. Please join us to make it happen! Note: If you enjoy my blog, could you please vote for me at the Culinary Hall of Fame? While you’re there, check out what Chef David and his wife, Pam Nelson are doing for culinary students. They’re awesome! I met you when you were at the Women Leaders of the World program at Santa Clara University. (I was dean of engineering there at the time and was one of the speakers.) I have always remembered the lessons you taught about vanilla, the tropical ecosystem, and the people whose livelihood depends on consumers buying pure vanilla products. This was before your cancer diagnosis, and I am both horrified to learn of your struggle and thrilled with your many victories. I (and probably many others) would very much appreciate an updated buyers guide to what constitutes legitimate vanilla products today. So many prepared foods (primarily ice cream) no longer say “pure vanilla extract” on the labels. Instead, they will say “real vanilla bean flecks” or “ground vanilla beans” or something else. I can’t tell if these provide real vanilla flavor or if they are the remnants after the vanilla flavor has been removed (with flavor than added artificially). We are absolutely captivated with your life. We just read your “Vanilla Queen” story and now this one, and are amazed with your passion and drive. Printing this post off to read whenever we question and doubt our new endeavor of ‘Season with Spice’. We just discovered your blog here, and can promise we will be coming back to read more. P.S. Read that you love nutmeg. If you are ever in Penang, let us know, and we will take you out for some fresh nutmeg juice. Balik Pulau (the west side of Penang Island) grows the best nutmeg in the world. I wonder if there is a expiry date for pure vanilla? Can anyone answer this for me? Because pure vanilla extract has a high percentage of alcohol, it tends to age for the first year or so. Over time it can slowly lose its strength. It certainly will have it’s full strength for at least a year. My hope, however, is that you will use your vanilla extract or beans frequently enough that you won’t need to worry about expiration dates. Not only does it provide great flavor to all kinds of foods, it also helps to support the farmers who grow it so that we never lose this amazing tropical flavor and fragrance.